The Datastore step of the wizard is available if you have chosen to change the location and settings for recovered machines. You can place an entire machine to a particular location or choose to store configuration files and disk files of a recovered machine in different locations. Select a machine in the list and click Path. To apply changes in bulk, select several machines in the list and click Path. Point to a folder where machine files must be stored. Expand the machine in the list. Select the necessary file type. Click Path and point to a folder where machine files must be stored. To create a dedicated folder for storing files of the recovered machine, click Make New Folder at the bottom of the window. 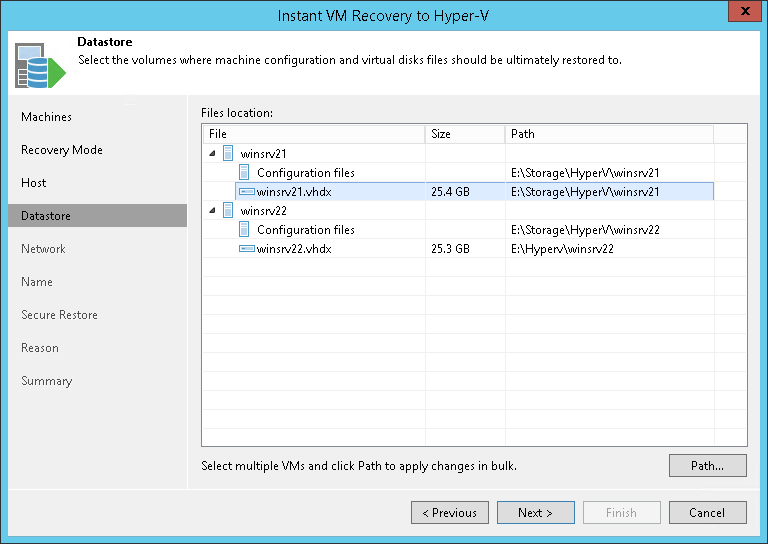 You can choose a Microsoft SMB3 shared folder as a destination for the recovered machine. Select the machine in the list and click Path at the bottom of the window. Type a path to the SMB3 shared folder in the search field at the bottom of the Select Folder window. The path must be specified in the UNC format, for example: \\172.16.11.38\Share01. The host or cluster on which you register the machine must have access to the specified SMB3 shared folder. If you are using SCVMM 2012 or later, the server hosting the Microsoft SMB3 shared folder must be registered in SCVMM as a storage device. For more information, see Microsoft Docs.